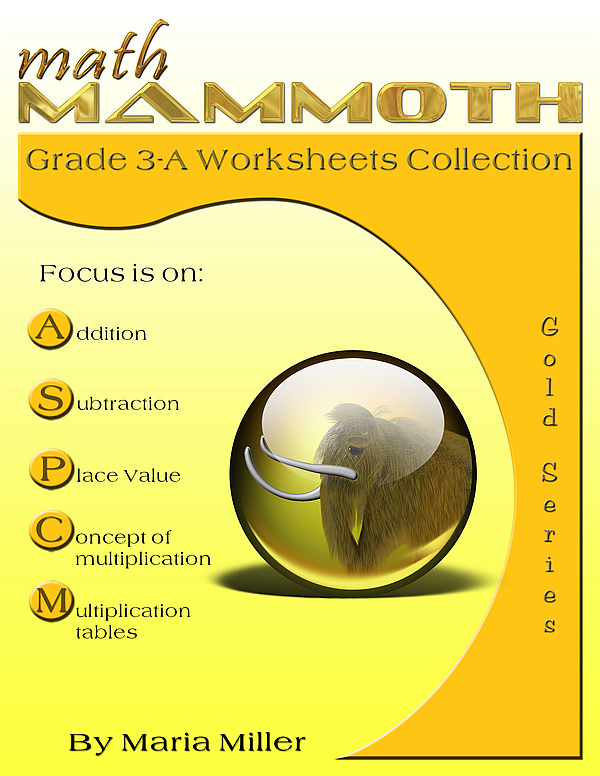 Math Mammoth Grade 3 Worksheets - download two reproducible math workbooks for 3rd grade. 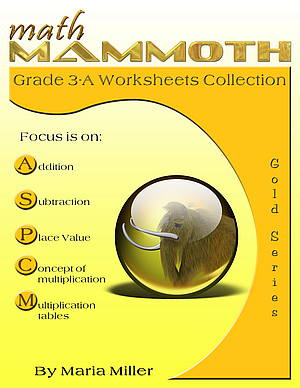 Math Mammoth Grade 3 worksheets comprises two workbooks, 3-A and 3-B, covering all 3rd grade topics. The worksheets have been created especially for teachers: each problem sheet is one page, concentrating on one topic. In essence, the problems in the sheets are like what you would find in a regular math book, and far from the mechanical worksheets created by a script. Note: The 3-A book includes some of the same material as the book Multiplication 1, though formatted differently, and the 3-B book includes some of the same material as the book Division 1. The 3-A worksheets start out with fairly simple mental addition and subtraction problems within 0-100 and accompanying word problems. Then comes place value practice with thousands (within 0-10,000), and adding/subtracting these four-digit numbers. Rounding and estimating are the last topics in this first segment and a few review worksheets follow. The next segment is all about the multiplication concept and practicing the times tables. There are worksheets for all aspects of the concept itself — such as how multiplication is commutative, multiplication on the number line, and multiplying by zero and one. There is a worksheet for each of the multiplication tables. They are in a specific order where we study the easiest tables first. Each table builds upon the facts already studied. Little tricks to help memorization are also explained. The practice worksheets also feature a multiplication chart where only those cells are empty that the student has studied up to that point and the rest of the facts are 'blocked out'. Filling the chart is very motivating for the student, because it is easy to see the progress as the facts that are still blocked out get less and less very quickly. There are two worksheets for multiplying 2-digit numbers, marked with an asterisk, since I consider these to be advanced for 3rd grade. Next come worksheets about measuring in the customary system and perimeter, and after that you will find again two review worksheets. The 3-B collection covers the rest of the 3rd grade topics: division, geometry, fractions, measuring, and graphs. After learning multiplication earlier on 3th grade, division is one of the major topics in the latter half. There are worksheets about the concept of division, the connection between multiplication and division, simple division practice, remainder, and dividing by 10 or 100. Long division is only touched briefly in two sheets; these may be given to the advanced students. Geometry section concentrates on learning about various polygons, exploring line symmetry and the area of rectangles. Fraction worksheets revolve around visual models (fraction pies). Almost all the problems in this section are based on pictures. For measuring, the collection includes worksheets for both customary system and metric system. Time worksheets concentrate on reading the clock. The last section includes a few miscellaneous topics and problems about charts and graphs. On my other website, you can generate additional, free 3rd grade math worksheets to supplement this book.